Anthropologist David Graeber has released a new book titled The Utopia of Rules, which is largely a collection of previous essays, loosely compiled around a favorite topic of ours here at Unfettered Equality: bureaucracy. …were it possible to investigate how these regulations came about, one would find that they were composed jointly by aides to legislators on some banking committee in a process greased by generous contributions to the coffers of those same legislators’ reelection campaigns. Graeber here plays a bit fast and loose with his claims, falling back on the epistemic inaccessibility of the state (“were it possible to investigate…”) rather than providing any solid evidence. As it happens, it is possible to investigate how regulations come about, and American history seems to bear out Graeber’s analysis. …there was, in the case of the railroads anyway, no sharp dichotomy or antagonism between big businessmen and the Progressive Movement’s thrust for regulation; and the purpose of the regulations, as seen by key business leaders, was not to fight the growth of ‘monopoly’ and centralization but to foster it. The point of this analysis is to suggest that bureaucratization is not something that has occurred purely because of large state organizations housed in those brutalist cement labyrinths that dot the D.C. landscape. Bureaucracy is not only – or even mainly – about the alphabet soup bureaus that the American right loves to lambaste. Rather, bureaucracy is a predatory structure of state capitalism that exists along a line of overlap between public and private. In other words, for Graeber, bureaucracy is about class: a managerial class vs. the rest of us. It is common knowledge that there exists a revolving door between large industries and the government agencies that regulate those same industries. That turning door is one of the gears of state capitalism. This story would seem at first glance to support a common libertarian response: lessen the government’s power as part of the equation, and the unfair advantages of the private institution will likewise be lessened, making the situation both more fair and more free. If you deregulate the industry, businesses will see less of a point in manipulating that industry through government influence. To put it pithily, get rid of the state power, and there will be no state power to abuse. 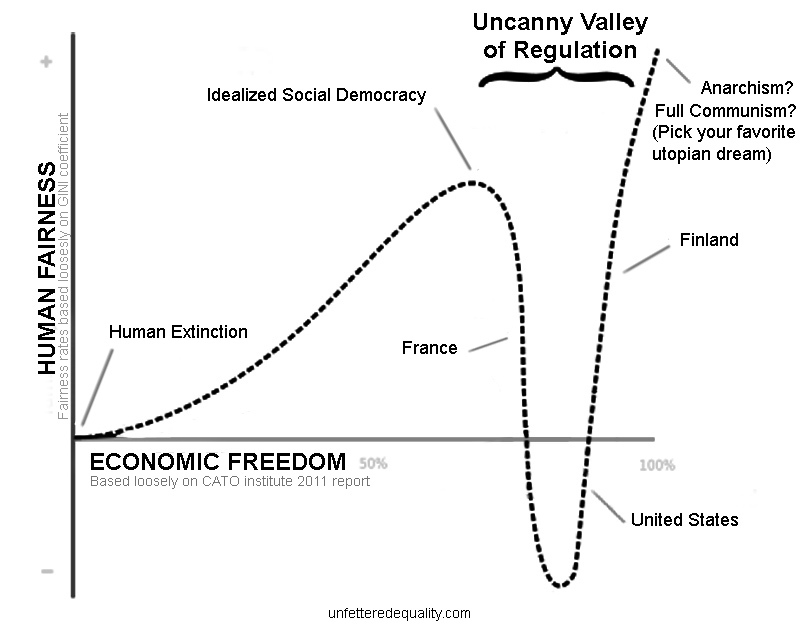 So what are people actually referring to when they talk about ‘deregulation’? In ordinary usage, the word seems to mean ‘changing the regulatory structure in a way that I like’… In the case of airlines or telecommunications in the seventies and eighties, it meant changing the system of regulation from one that encouraged a few large firms to one that fostered carefully supervised competition between midsize firms. In the case of banking, ‘deregulation’ has usually meant exactly the opposite: moving away from a situation of managed competition between mid-sized firms to one where a handful of financial conglomerates are allowed to completely dominate the market. But what could be a possible driving force for Graeber’s law? What possible mechanism underlies the seeming unstoppable march towards increasing bureaucracy? An analogy from art could be useful here. 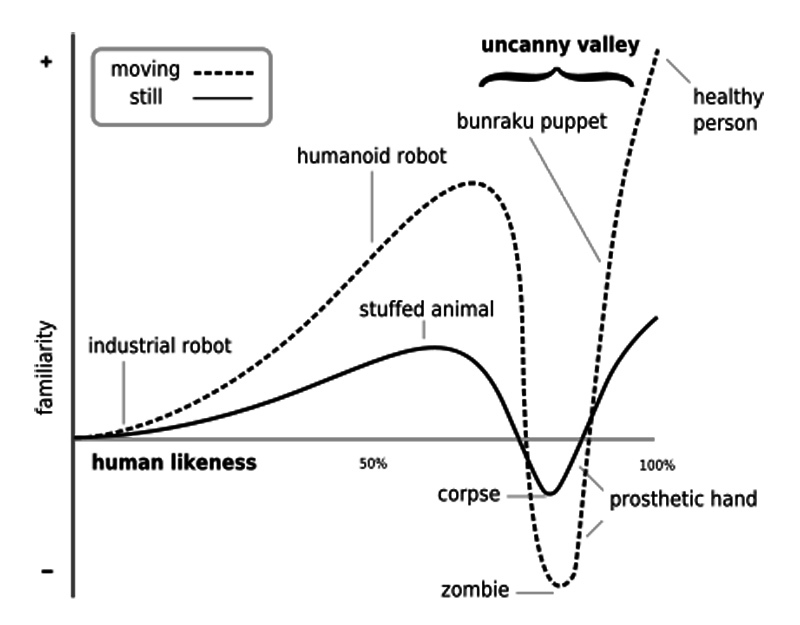 In computer graphics, Uncanny Valley Syndrome refers to the feeling of revulsion the audience experience when viewing a character that is almost human, but not quite there. This is why Wall-E is more appealing to us than a humanoid robot with synthetic skin. There exists a vast trough of severe unnaturalness between the peaks of definitely-not-human and definitely-human. This graph is just a loose approximation. … of course, the power of those same banks to charge account-holders eighty bucks for an overdraft is enforced by the same court system content to merely collect a piece of the action when the bank itself commits fraud. John Rawls famously argued that a society should be judged on how it treats its most vulnerable members. Our society seems to be organized around how it treats the strong.